It is now possible to treat these three dimensions of the aging process with non-surgical methods that leaves patients skin rejuvenated and maintains an all-natural look. I tell patients to think of this as turning back the clock on your skin a number of years gently and without the need for going “under the knife”. 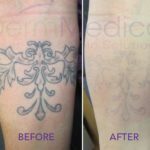 Laser skin therapy combined with no-downtime injectable treatments are now the most common treatments requested by patients. 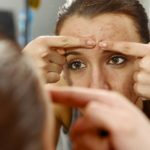 This trend of non-invasive and nonsurgical skin treatments is only growing and has already overtaken those older surgical methods by a large margin. 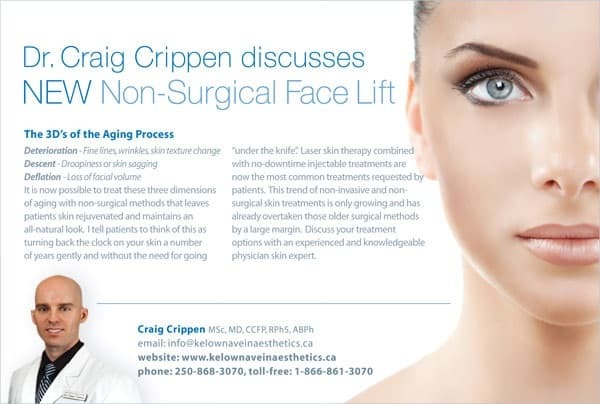 Discuss your treatment options with an experienced and knowledgeable physician skin expert like Dr. Crippen to stop or even reverse the aging process. What Aging Process causes droopiness and deflation of the cheeks? Toronto droopy cheek patients are experiencing a common area of facial aging process, specifically, facial aging influences resulting from a loss the fullness of youth and subcutaneous fat (under the skin fat) that is present in a youthful cheek and midface. With a loss of fat of the cheek there is a loosening and drop of the facial soft tissues. Loss of support in ligaments and loss of dermal elasticity or skin elasticity contributes and assists in the descent of the cheek and cheek fat pad. With a descent and droopiness of the cheek there is a hollowing out of the lower eyelid region, a loss of cheek volume and projection. There can be multiple grooves across the cheek in addition of the smile lines, with a down going descent at the corner of the mouth and more evident jowl, with loss of the jaw line. All these features and signs of droopiness and descent of the cheek can be addressed with different procedures. Can I treat my droopy and deflated cheeks? And if so, how are they treated? If I have my droopy, wrinkly, deflated cheeks treated, can they come back? And how can I prevent that? Droopy cheek and wrinkly cheek skin patients who have their aesthetic concerns addressed with either cosmetic cheeklift procedure or some non invasive procedures will undergo a natural and normal facial aging process of the cheek, with loss of the volume that was created and wrinkling of the skin after their procedure. In general, DermMedica™ physician Dr Crippen will recommend some non surgical treatments that are designed to be performed intermittently throughout the year, perhaps once every three to four months, in order to protect the youthful vitality and the youthful rejuvenation that has been achieved through a cosmetic plastic surgery cheeklift or non-invasive cheek enhancement procedure. These maintenance treatments may include Botox, soft tissue fillers and fractional infrared and radiofrequency skin tightening procedures.